Sonshine is a beautiful home overlooking a 12,000 square foot swimming pool, just steps from your door along a palm tree-lined walkway. The house has three bedrooms and a bunk room. The exterior and interior of the home was painted and hardwoods were added to all the bedrooms and stairs the summer of 2014. Every room has a flat screen tv. The two master suites (both Kings) located on the top floor have their own private baths. The third bedroom (Queen), bunk room, and bath are on the bottom floor. The main living area is on the second floor and provides a quiet separation between the 1st and 3rd floor bedrooms. And there's a total of 3.5 baths, so there's no waiting! We are now a DOG FRIENDLY home! With the addition of our sweet boxer puppy Bacon, we have decided to make our beach home dog friendly so our family, as well as yours, can travel with our four-legged family members! See rates below. You can use the book now option on VRBO. Seacrest Beach is located halfway between Destin and Panama City on 30A. Known for its crystal blue ocean and white sugar sand, Seacrest Beach is the perfect location to enjoy the beauty and serenity of the ocean. 30A is known as a great location for families; everything is easily accessible through either walking, biking or driving. It is not commercialized and is a family friendly area. When you’re not lounging by the huge pool or beach, explore the many other recreational opportunities nearby. Rosemary and Alys beach are within walking distance and both have a number of additional activities including additional restaurants, shopping, playgrounds, spa facilities, festivals and movies (in-season). The house is fully furnished with linens and also includes beach towels. The kitchen is fully equipped with all appliances, cookware, dishes and utensils. Nearby grocery stores include Publix (3.7 miles) and Winn Dixie Marketplace (9.6 miles). Recommended airport is Panama City Airport (ECP, 21 miles). Restrictions: Rentals to anyone under the age of 26 is prohibited. No smoking inside the home. We have been married for 11 years and bought our townhome approximately 6 years ago. We reside in Brentwood, TN which is just south of Nashville. We have 3 boys and named the townhome after them. When we aren't enjoying the beach, we enjoy snow skiing and pretty much any activity (baseball, karate, football, basketball, soccer, church, school activities, etc.) our boys are involved in. We vacationed to Seagrove and SeaCrest Beach several times prior to purchasing our place. 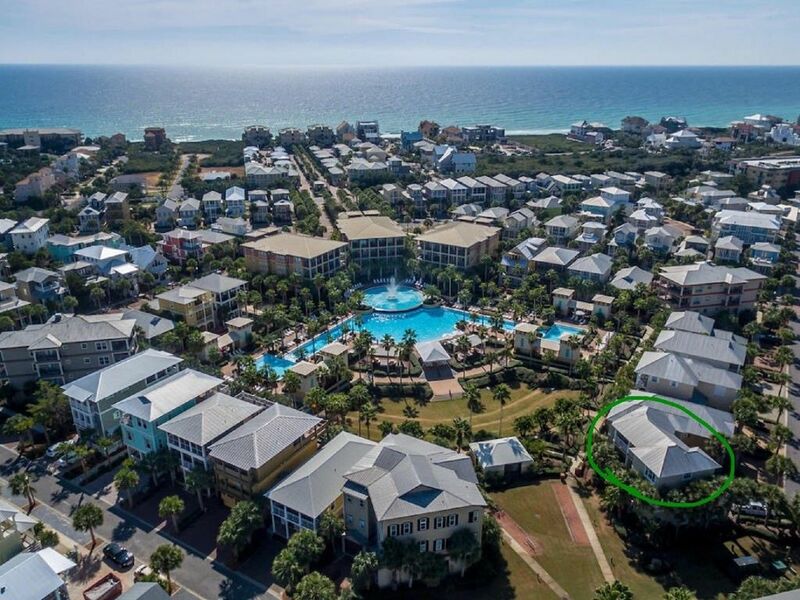 We enjoy the family friendly atmosphere of 30A, the number of quality restaurants that are available, the ability to walk to most locations, the beautiful beaches and the pool at SeaCrest. We often spend the morning at the beach and then go to the pool in the afternoon which is right outside our door. SeaCrest Beach North is very affordable compared to Rosemary and Alys Beach. While not on the beach, SeaCrest Beach North has several trams that pick you up at your stop which is right outside your door and drive and pick you up from the beach. There are approximately 10-15 restaurants within walking distance (Rosemary, SeaCrest and Alys Beach). Two private bathrooms on the 3rd floor, one half-bath on the second floor and one bath on the 1st floor which is shared between the queen bedroom and bunk beds. One of the few houses in Seacrest Beach North with a garage. Standard Mr. Coffee that uses basket filters. There are 2 decks. One off the second floor and one off the master king suite on the third floor. Huge 12,000 sq ft pool outside the back door! The house is delightful. Plenty of room. Beautiful view from front window. Comfortable beds, and plenty of fluffy white towels. But the best is the owners, So sweet and kind. They really want you to have a good time. We will book again. We were kicked out by Hurricane Michael several days early, but Jennifer was great to work with and responded quickly. This property had a good location near the beautiful Seacrest pool and a grassy area outside to play! The owner was wonderful to work with and Seacrest is a really cute place! The tram stop is right outside the property which is very convenient! There is lots of space to spread out. It is very nice that they provide some beach towels and some beach items like low chairs and a boogie board! Definitely read the rental agreement to see what is provided because I didn't and was scrambling to the store to get some soap on our first night for showers:). Sonshine was a nice property right on the pool. The owner was great to work with and was easy to contact. We enjoyed the convenience of the location with the tram stop to the beach right in front of the condo or you could take the short walk to the beach right around the corner. We also liked the fact that the third level had two master suites. The condo was equipped with beach chairs and toys and a nice garage to store our bikes. The biggest negative to me was that every time we went outside on the balcony to enjoy coffee or have a bite to eat, the neighbor was outside smoking and we would have to go in. It seems as though they live there, but I am not positive. Overall we had a great trip! We had a wonderful family trip to Sonshine! The house was very clean and well equipped. It is a short walk to the beach, but you can take the tram if you call ahead. Overall, it was a great experience.